Yay for the weekend! If you had the fourth off, did you have a good time? Eat lots of BBQ? Watch fireworks? I took LO to the pool on Wednesday and she had a blast! At first she couldn't make heads or tails over all the water she was in, but once she got the hang of it, she didn't want to leave. Once I took her out of the pool, she cried and cried. Poor thing. We also went down to the OC again to get some treats to take back to my father back in PA, and then later we watched fireworks on the roof. LO wasn't too interested in the flashing lights, they weren't close enough for her and when she did see one, the subsequent firework didn't happen quick enough so she'd lose interest. There were a ton of fireworks citywide though - the entire skyline south of us was lit up a full 180 degrees around. There was a ton of smoke in the air too, and the smell of burning fireworks didn't dissipate until late night. Recently, I found that the Born Pretty Store had some reasonably priced holo polishes on their website so I decided to purchase a couple to see how they perform. Upon arrival, I was disappointed to see how tiny the bottles were, approximately 6mls(I should have double checked prior to ordering). I shouldn't complain though, holos in general are pricey and it's difficult to find any under $10, especially in a full size bottle. In these pics I used two layers for both shades with no basecoat or topcoat. The first I have for you is a a medium teal blue known as #8 on the Born Pretty Store website. The formula is a bit sheer which you can see in the photos, but it wasn't noticeable in real life. I was hoping for more teal in the shade but it translated as more blue. The first shot is in the light tent and the rest are under direct light. 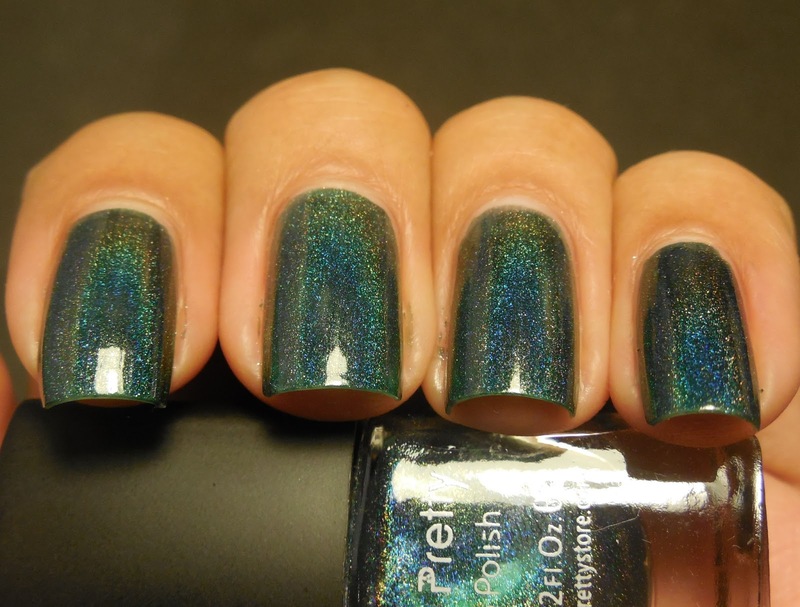 My 2nd polish is #12, a darkened green holo. I really love the uniqueness of this shade and was my favorite of the two I picked up. I can definitely see myself wearing this a lot in the fall. Again, first shot is the light tent, the rest are under direct light. 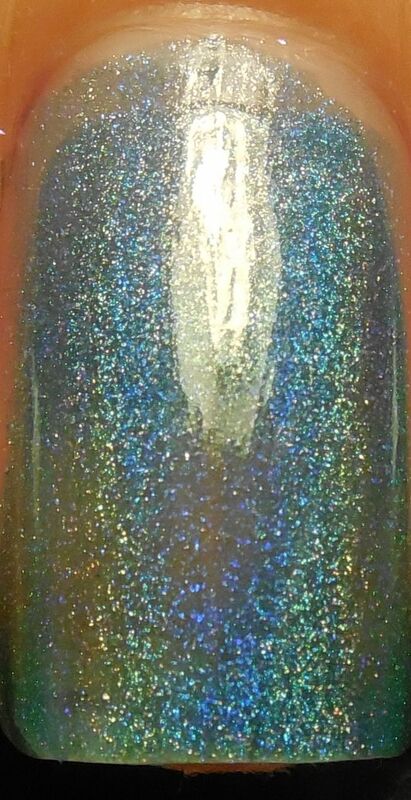 I was really curious to see how this color compared to the original dark green holo, Glitter Gal Lizard Belly. From what I can tell, although the bottles look similar, they're not dupes. 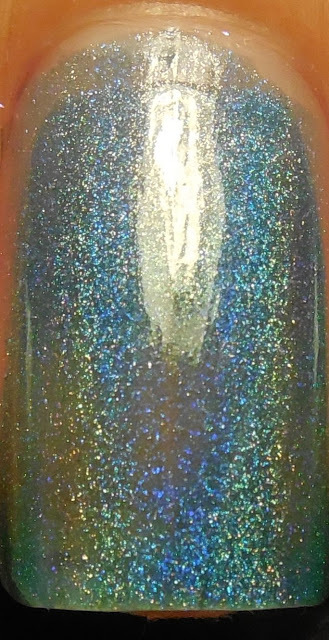 Lizard Belly is significantly darker and doesn't have as much of a holo flare compared to the lighter shade of the Born Pretty Holo. I hate to say it, but I think I like the Born Pretty Store version better than Glitter Gal Lizard Belly. The bottles are 2mls difference in size, but the Glitter Gal is significantly more money. Overall, for the price I really think these holos are worthwhile, especially if you're missing a color from your collection. There's a wide range of colors to choose from and with free shipping, you can't beat that deal. I like the teal because of it's dark undertone. The formula on these could be better but they are pretty! They sure are pretty! I ordered the orange one right after I wrote this post! I don't mind the fact that it's thin, especially if it's seamlessly buildable. This one reminds me of aEngland's St. George. I agree, it does look a little like St George except with a linear holo. I can't decide which I like better!